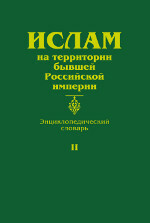 “Islam in the Territories of the Former Russian Empire” encyclopedic lexicon was being published in the form of separate issues — in 1998, 1999, 2001, 2003 and 2012 — in the process of data accumulation. In 2006, the augmented and emended entries of the earliest three issues were published as the first synoptic volume. The present, second synoptic volume includes the materials of issues 4th and 5th, which have been edited and augmented with new data, as well as the entries from the 6th issue that has been prepared earlier. The contributors of the entries are dozens of specialists from Russia (Moscow, St. Petersburg, Ufa, Kazan, Makhachkala, etc. ), Uzbekistan, Azerbaijan, Germany, the USA, Ukraine, Turkey, Japan, the Netherlanda, France, etc. The material of the entries sheds light on the various forms in which Islam have existed in the lands of the former Russian Empire from the time of its formation to this day. The lexicon gives a thematic presentation of historical figures, places of cult, architectural monuments and written records, rituals, etc. The volume has a large number of illustrations and a set of extensive indices.